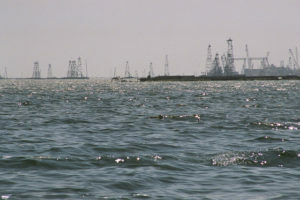 Oil Rocks, which played an important role in the oil history of Azerbaijan, is located in the south-east of the Absheron Peninsula. The settlement was originally named as “Black Stones“, but was later renamed to “Neft Daşları” (“Oil Rocks”), replacing the allusion to the black colour of oil with a reference to the substance itself. 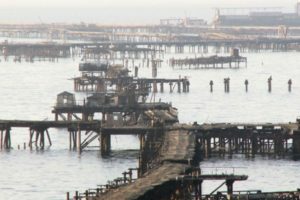 A man-made city of platforms on the sea, Oil Rocks (Neft daşları) has a special and unique history and story to tell. The name “Oil Rocks” has historically importance in our history and in the world’s history too. 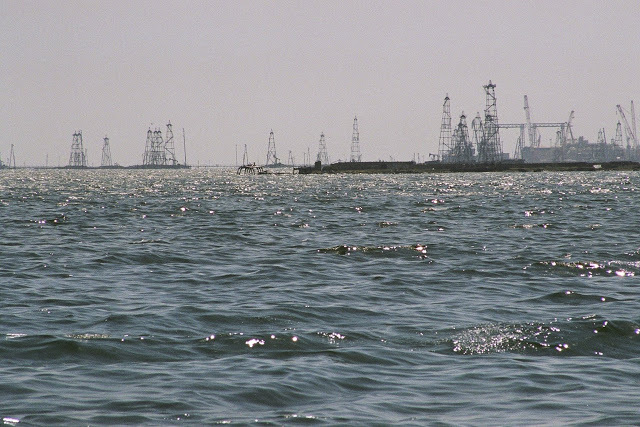 Oil production is now mainly offshore in the Caspian Sea. Oil Rocks is a city in itself the Caspian Sea. 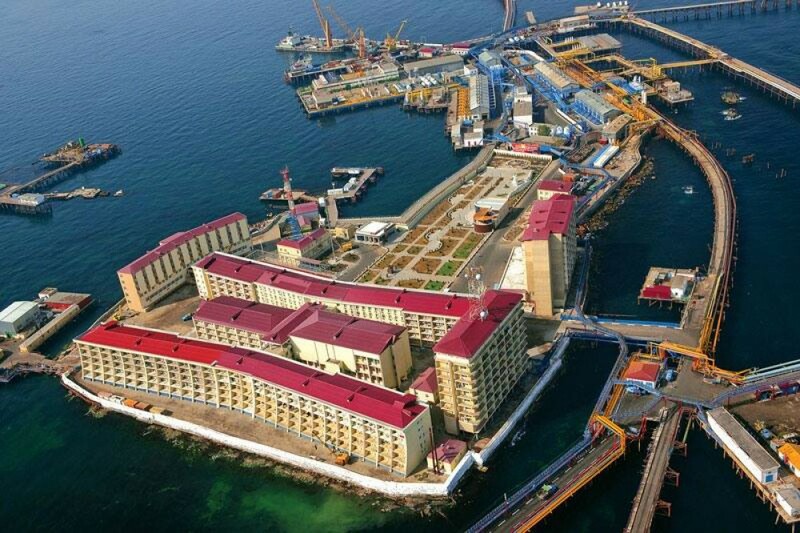 It is the first operating offshore oil platform in the world and an industrial settlement in Baku, Azerbaijan. The settlement forms part of the municipality of Çhilov-Neft Daşları in the Khazar region. 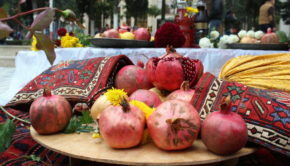 It lies 100 km away from the Azerbaijani capital Baku, and 55 km from the nearest shore in the Caspian Sea. A full town on the sea, it was the first oil platform in Azerbaijan, and the first operating offshore oil platform in the world, incorporating numerous drilling platforms. It is featured in Guinness World Records as the world’s first offshore oil platform. “Neft Daşları” is even featured in a scene in the James Bond’s film “The World Is Not Enough (in 1999)”. 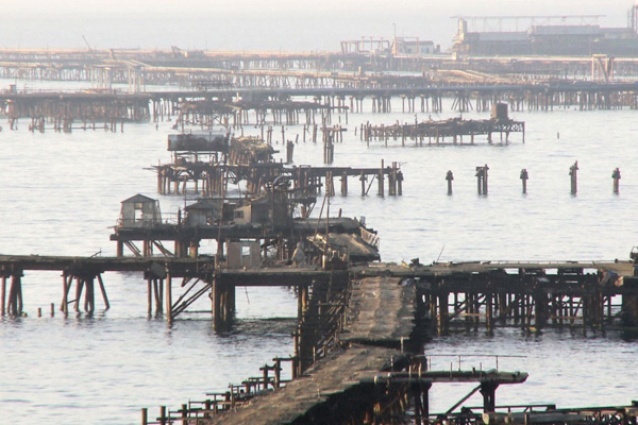 Long before the discovery of the underwater oil deposit, mining engineer Fatullabey Rustambekov wrote many articles in the magazine “Azerbaijan Oil Industry” about the development of sea-based oilfields in the Caspian and he suggested methods of developing the fields. He listed six potential exploration sites on the Caspian shelf and the epoch-making discovery of Oil Rocks in 1949 proved him to be correct. The first large-scale geological study of the area was conducted in 1945–1948.The first practical work to study the geological structure of the area around Oil Rocks was conducted in 1946 by an oil expedition from the Azerbaijan Academy of Sciences; this resulted in the identification of huge reserves of oil. Although “Oil Rocks” area had bad reputation among all sailors and fishermen, our brave Azerbaijani geologists, captains wrote their names not only in Azerbaijan’s oil history and also in the world history. 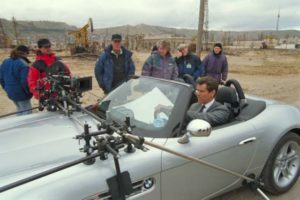 The history of Oil Rocks is connected with the name of Aga Kurbanov and his brigade. After the prediction of the famous geologist Aga, the search for oil deposits in the sea began. Also Captain Ajdar Sadikhov was one of the most experienced post-war Caspian captains. Drilling expert Yusif Safarov and Sabit Orujov, head of the “Aznefterazvedka Association” (Azerbaijan Oil Exploration), were in his brigade. 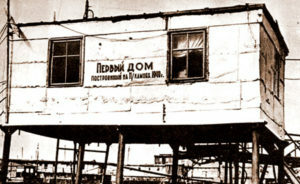 Before 1945, oil engineers S.A.Orujov and Y.Safarov proposed a method of tubular collapsible constructions for offshore bases. This method enabled quick installation under oil-rig at any season. This team successfully landed on the islet and even managed to construct the first drilling installation and a small hut for a drilling crew (an expansive 14 square metres!) So in 1947 under the leadership of Aga Qurbanov, a brigade of 23 members brought seven ships to the area, from the ships they used as a shelter and warehouse. That’s why Neft Dashları “Oil Rocks “ is called “The Island of Seven Ships”. So on November 14th, 1948, under Aga Qurbanov’s leadership, they began first offshore excavation work. On November 7, 1949, the first oil fountain in the sea began. This laid the foundation for oil production in the the sea. Daily oil production was 100 tons. After three years, intensive development began in 1950. Development from multiple drilling sites connected by trestle bridges also employed deviated holes. February 18, 1951, the first tanker filled with Oil Rocks supplied the Dubendi port for evacuation. As a result of intensive geological and geophysical mapping during 1950-60, Caspian oil and gas bearing structures were determined. The discoveries included such fields as “Darwin Bank”, “Gum Deniz”, “Djanub” “Chilov-İsland”, “Hazi Aslanov” and so on. Several large oil and gas fields were discovered in the following decades. 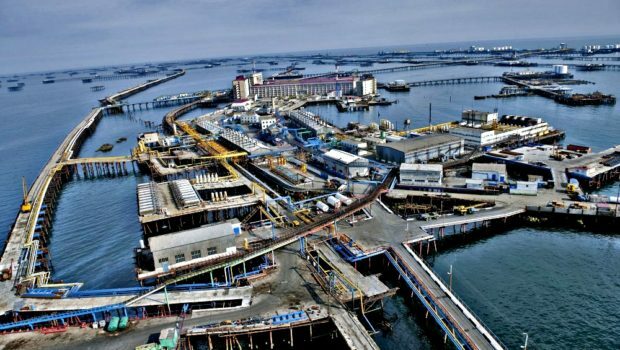 As a result of modern methods of exploration new fields were opened in the Caspian Sea at the depth of 200 meters: “Gunashli”, “Chirag”, “Azeri” and “Kapaz”. The underwater oil pipeline from Oil Rocks in use today was only constructed in 1981. 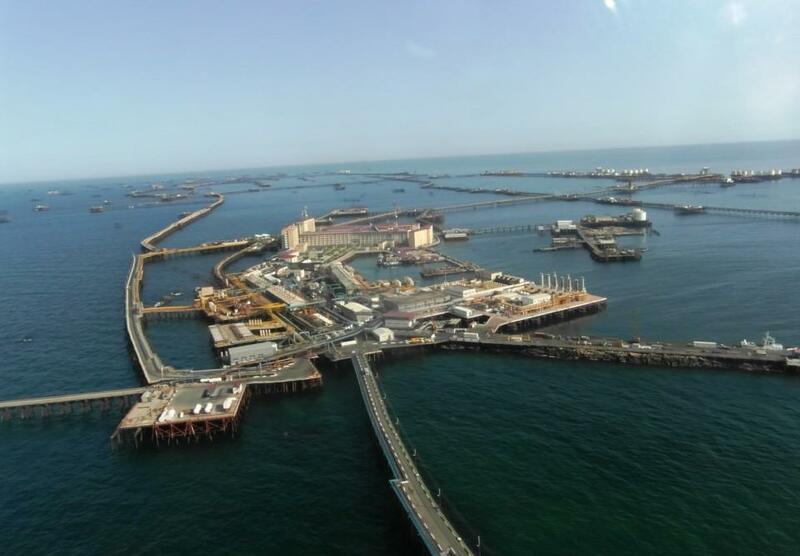 Oil Rocks today consists of more than 200 stationary platforms, and the ‘streets and lanes’ of this city on the sea stretch for 350 kilometres. Oil Rocks has made a valuable contribution to the education of the industry’s workers in Azerbaijan and the whole of the former Soviet Union. Many innovations and experiments have been done there. For the first time in the USSR a new method of drilling was approved; the new trestle platform arrangement in the Oil Rocks field is still so unique for its life style. 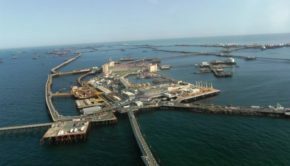 All experience gained there gave impetus to further exploration and exploitation of other oil and gas in the Caspian Sea and in the world oil industry. Counting with a population of over 5,000 men (families stay on shore!). Most of the inhabitants work on shifts – a week on Oil Rocks a week on shore. 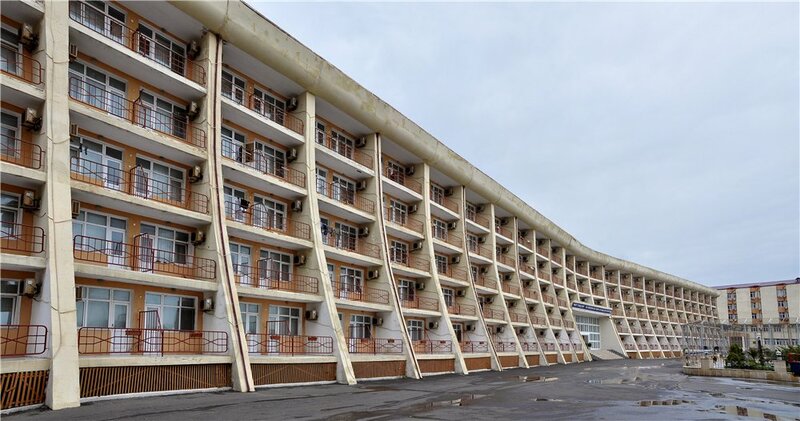 There are tall blocks of flats, a bakery, a cinema, a garden, a school.